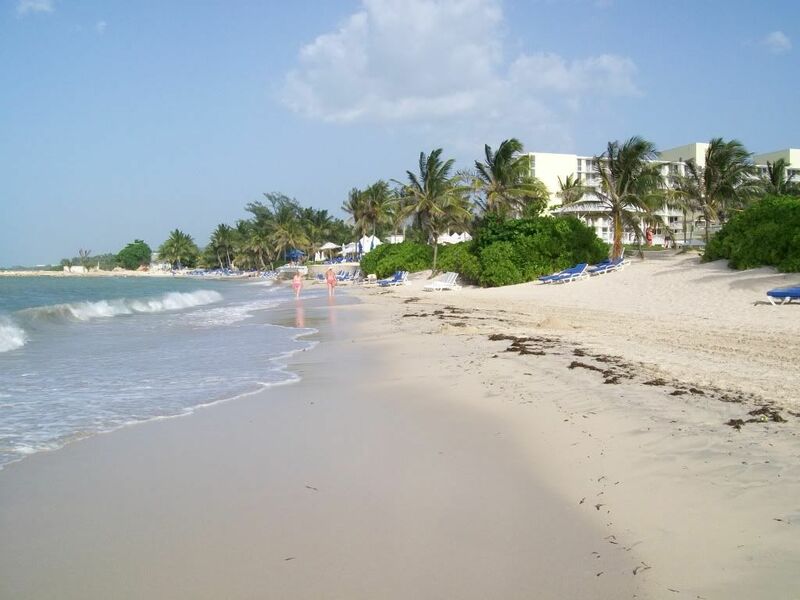 The long flight from Gatwick to Jamaica ended with touchdown in Montego Bay airport, and 400 weary but excited Virgin Passengers disembarked and hurried to clear immigration and baggage handling. Getting through customs was the usual tedious wait and stone cold eyes of scrutinineering with all the evidence of a humour bypass having been carried out on the officials. Baggage reclaim was somethong else - a 1.5 hour wait before the first bags started tumbling off onto the carousel, and another half hour before we had all our baggage and departing the airport to the waiting coach tranfer. On boarding we await our fellow travellers and the VIrgin courier, who cheerfully advises us that our transfer is just a 20 minute ride. It's dark and we can see little other than the dual carriageway out of Montego Bay airport and 30 minutes later we arrive at the resort. The lobby is impressive and check-in is unhurried and polite but totally devoid of personality or feeling. A bell hop takes us and our baggage to our room which is clean and comfortable, so after a quick refresh it's time to get down to the buffet resturant for a good meal . We collect Carole & Giuseppe on the way down (we are in room 372, they are in 366) and find our way down to the desk and wait to be shown to a table. Inside it is nicely cool and fully air conditioned, outside it’s warm and humid. There is a good, wide choice of food with some being cooked to order in full view. After the meal we move outside, take a drink at the bar and watch the end of the evening's entertainment which is an excellent steel band Silverbird. They are young, energetic and full of enthusiasm which is both obvious, genuine and infectious. When they finish we head to bed, totally bushed. Pick-up is scheduled for 9am and as uaual we get down to reception a few minutes early, to find our transport and courier waiting so that we are on the road for 8:50, heading to make other pick-ups on the way to Martha Brae. Denise the courier is knowledeable and constantly points out things and places of interest. All told there are 11 of us on the Toyota Coaster (mini coach) by the time we drive through Martha Brae (the place) on the way to Marthe Brae (the river). The village is typical of many we see on these excursions – poor quality housing, unmade or poorly maintained roads, few facilities and plentiful evidence of poverty and unemployment with an almost oppresive air of threatened violence and crime. 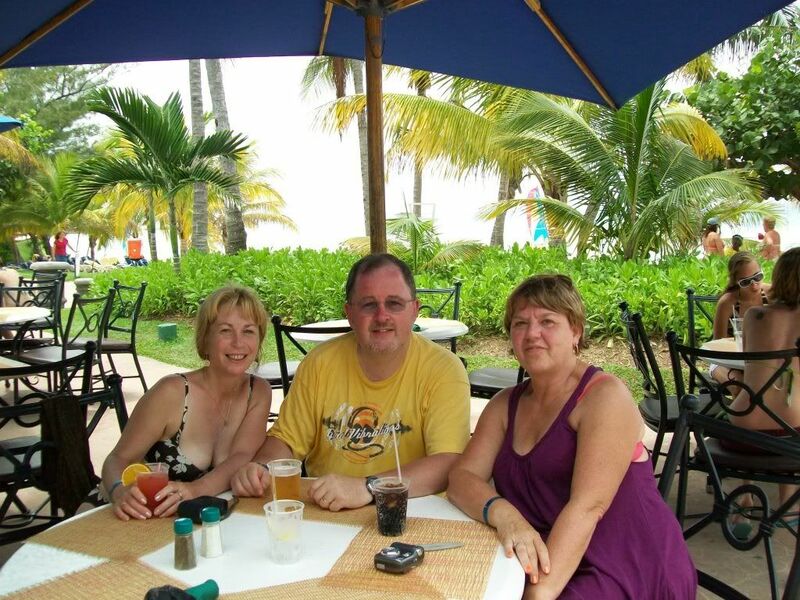 Sue and Carole on the beach at the resort. The Rafting activity centre, by contrast, is well maintained with a quality tarmac drive down from the road to a well maintained gardens (floral and herb) a bar and restroom facilities. Denise tells us what to expect before we leave the coach and we follow the itinerary laid down, with an on foot tour of the herb gardens, a curtesy drink at the bar before being issued life jackets (they have to issue them, we don’t have to wear them thank goodness) while a local group performs music and dance. 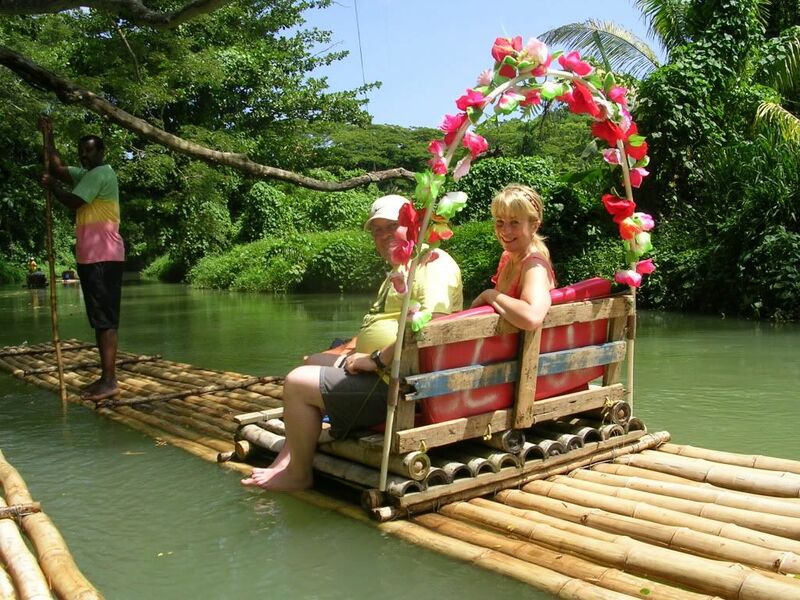 We then walk to the staging point to board the rafts, as couples, for our slow river trip. Back on the coach, we are taken to a resturant at Ochos Rios for a inclusive lunch, simple but good fayre. We shoot a few photos and then get back to the coach for the trip to Duns River Falls, collecting rented aqua shoes on the way. Again Denise warns us what to expect should we stray into the “Craft Market”, which we avoid. We are guided all the way, initially becoming part of a larger group heading to the beach which is the starting point for our climb of the falls. Energetic, but great fun is the only way to describe it. Fantastic even. Caught on film by Leroy, which is cut onto DVD available to purchase for $40 US as an eternal momento. Water that seemed freezing at the start of the climb isn’t cold enough by the time we get to the (appointed) top of the climb. Then it’s back to the coach, stopping off to return the rented Aqua shoes before returning back to the resort, a 1.5 – 2 hour drive in the Toyota Coaster. Up early for a 6:30am pick-up. The ubiquitous Toyota Coaster arrives and we depart on time. Johnson the driver has his foot hard down and we make good time, so he detours off the main road and takes us through Falmouth and shos us some local life. Falmouth resembles Martha Brae (the place) in that it is basically poor, awaiting revitalisation by cruise liner tourists when a new port development completes in 2 years time. The newly completed fire station is impressive, the rest is depressing. Most of the housing is low level bungalows which have wrought iron steel work to keep posessions in and thieves out. Crime appears to be an acceptable way of life and even at that early hour the main square is full of (mostly male) locals just hanging around – unemployment is high and there’s no welfare benefits. Rambo? Tarzan? No, that's Giuseppe. 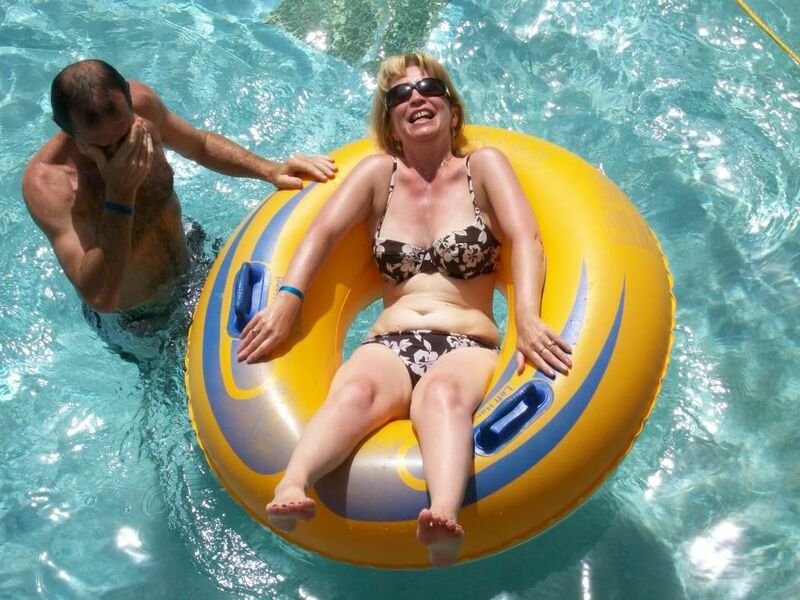 Sue in the pool - Giuseppe "helping". Back on the main road to Ochos Rios we stop at a hotel to pick up another couple booked on the tour, husdand and wife, he’s from Italy and she’s from California. Quickly they are chatting to Carole and Giuseppe in Italian. On reaching Ochos Rios we are dropped Off a Burger King for 15 minutes while the coach is refuelled and a new driver and courier take over. That 15 minutes becomes an hour before the Toyota returns and we set off across te island, through Spanish Town and Kingston then up into the hills to the plantation. 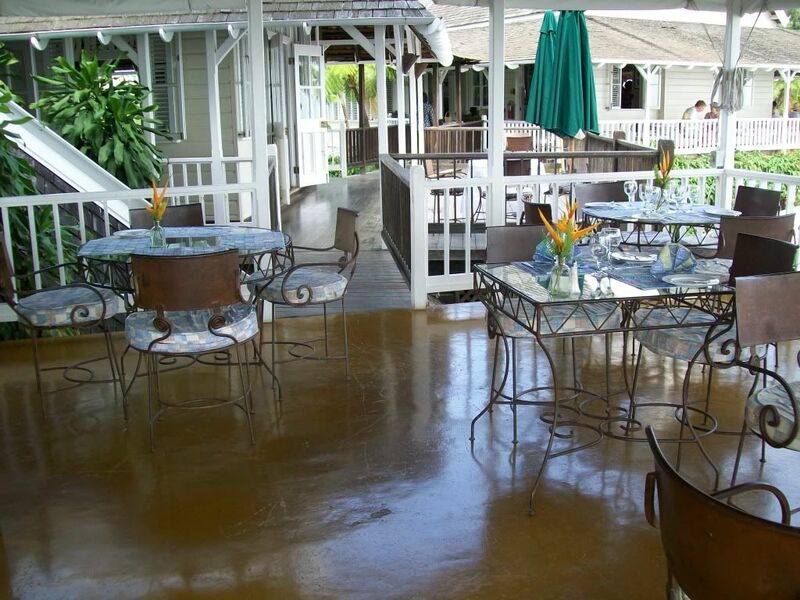 The plantation house is an old colonial house of wood construction and is in well kept grounds. A “Lenny Henry” look-alike serves coffee to those that want one (I don’t drink the stuff) then proceeds with a presentation on coffeee and it’s history on the is land and the plantation, and then escorts us up onto the plantation on a very well worn footpath, stopping at intervals to explain features and views. At the top we enter a raised pergoda for great views and photo opportunities before returning to the house for purchases of bags of coffee beans. Then we are back onto the coach for the short trip to Strawberry Hills, owned by music producer Chris Blackwell. 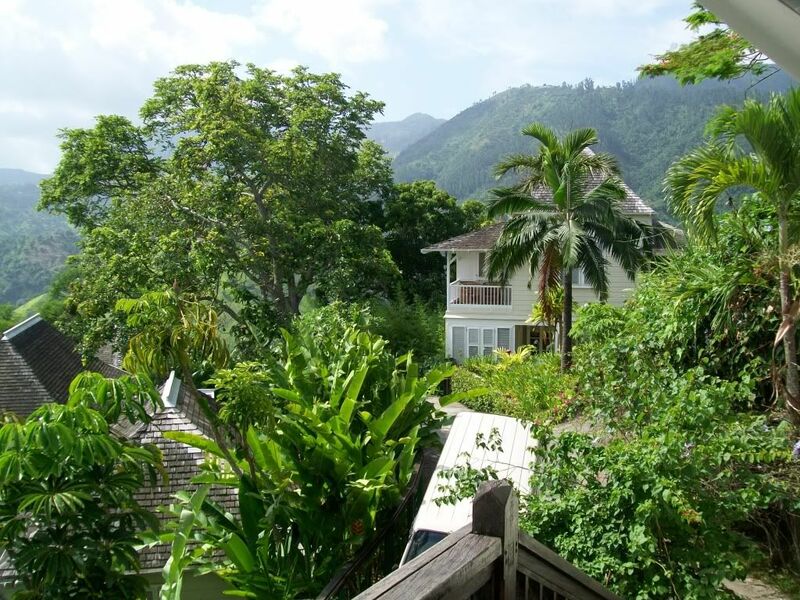 We are booked in for lunch which is a very pleasant affair, a tour of the estate, eternity/plunge pool, guest rooms and “gong” room, all nice and relaxed. This done we start the long return trip, stopping at the Bob Marley museum for some photos and Devonshire House for superb ice creajm cornets. Rush hour traffic in Kingston slows our return to Ochos Rios so much that when we get to the hotel of the “Italian” couple we are transferred to a Mitsubishi Shogun 4x4 for a more comfortable transfer back to our resort, and a late dinner sitting down at 9:30pm. Not such an early start as for the Blue Mountain, but, another long day, largely because of the number of pick-ups in Montego Bay and the need to refuel the coach at Montego Bay airport, which wasted over half an hour. Once under way we were treated to the delights of a main road that would go from mostly excellent tarmac to unmaintained, to under construction and off-road diversion with seemingly never ending frequency and in short order. 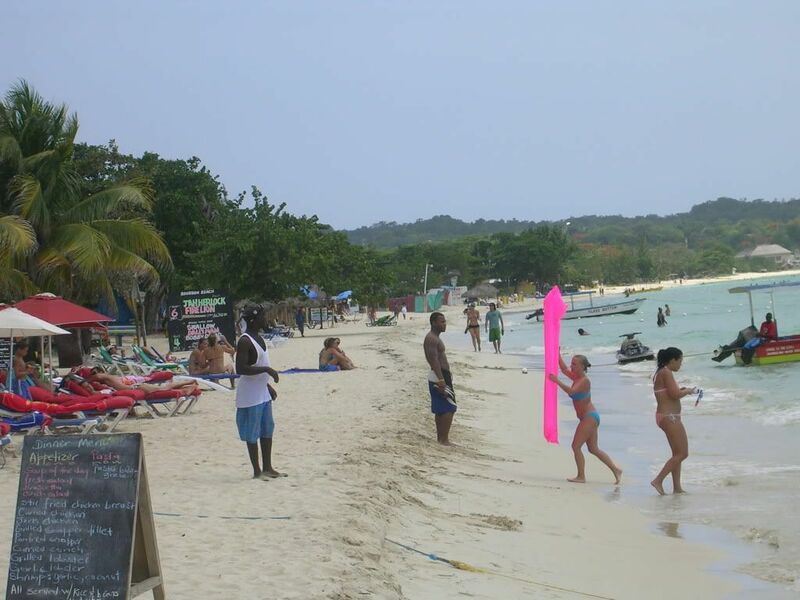 The arrival at Negril Beach matched the need to stretch the legs and relieve sore bums. The day was initially clear, sunny and very hot. The sun beds provided by Jamaica Tamboo were all broken and fit only for the local dump. On the up side, the water was beautifully clear and a good hide-away from the beach hawkers. The sand was bright and clean and the bathing nice and shallow. Lunch was not included on this trip but individually prepared by Jamaica Tamboo, provided you waited long enough, fast food it wasn't. The skies clouded up while we ate and rain fell as we were departing (after a 4 hour stop) for Rick’s Café. 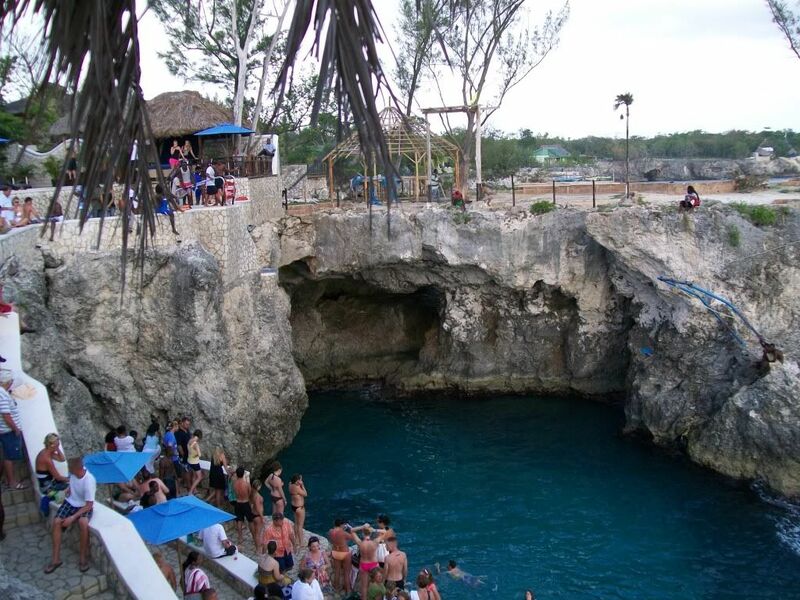 Built on the cliff top, Rick’s Café was a brilliant location to observe cliff top divers with many tourists (mainly male) joining in. 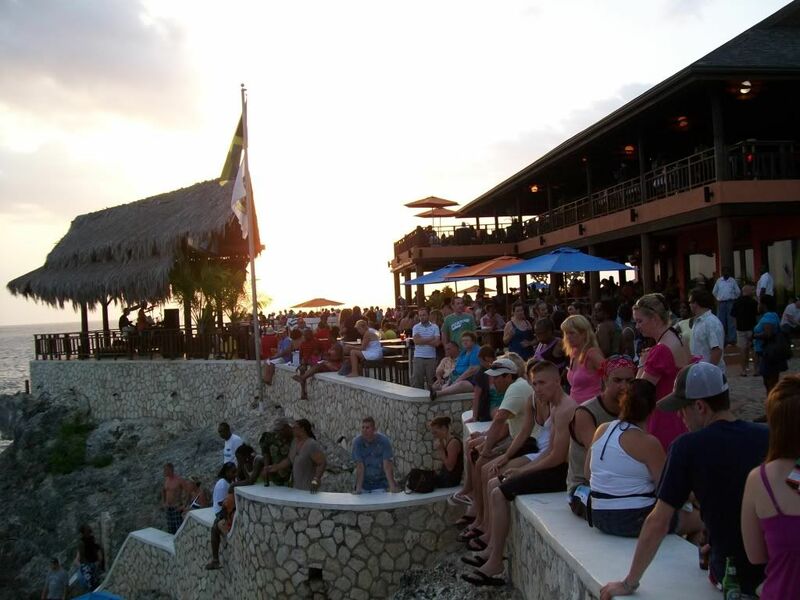 We were there to observe the sunset as it reputed to be THE place on the island to sunset watch. Giuseppe behind the lens, Sue, Phil & Carole in front. However, the courier's schedule meant that we left 15 minutes before the sun went down beyond the horison, for the tortuous trip back and another late meal in the resort's buffet resurant. Sunday evening is steel band Silverbird and limbo dancers, the rest of the time it is regae by a local band Tribal Impulse. Silverbird is a quality actSilverbird They are young, energetic and full of enthusiasm which is both obvious, genuine and more than can be said of Tribal Impulse, and while the limbo is entertaining they come across as jaded and the routine is tired and in need of someof Silverbird’s enthusiasm and energy. It was OK to watch the first time round but boring on the second showing the following week. There is a Motown night which we missed the first week due to taking the Blue Mountain trip, and the 2nd week local regae hero Frankee Paul was in the audience and with Tribal Impulse as backing group, he proceded to take over for the evening so we never got our Motown night. The problem with Tribal Impulse was the constant competition for who can be loudest between the lead male singer and the band, which the band wins with the help of the sound engineer who I can only assume is either deaf or totally oblivious to the result of his fiddling with the sliders. Except, he turned them down when Frankee Paul was on stage so he must know what he’s doing. Unfortunately, when the usual lead and backing singers were on stage it was difficult to make out a single word being sung thanks to the band. The fire eating and ritual dance / singing group is a welcome change to regae, as was the quiz night (where you can cheat if there for a 2 week vacation as they use the same questions each week, so collect all the answers on week 1 and win on week 2). 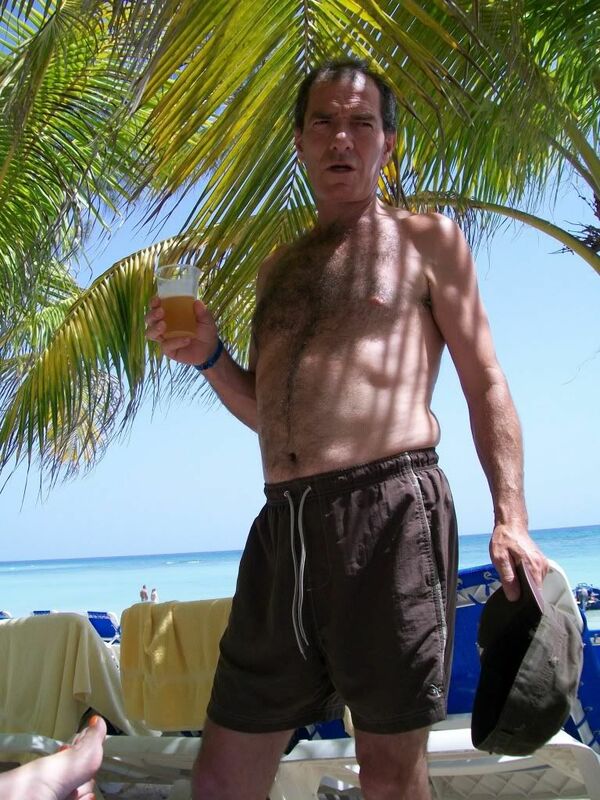 Billed as an organised (by Virgin) shopping trip into Montego Bay, this turned out to be anything but. 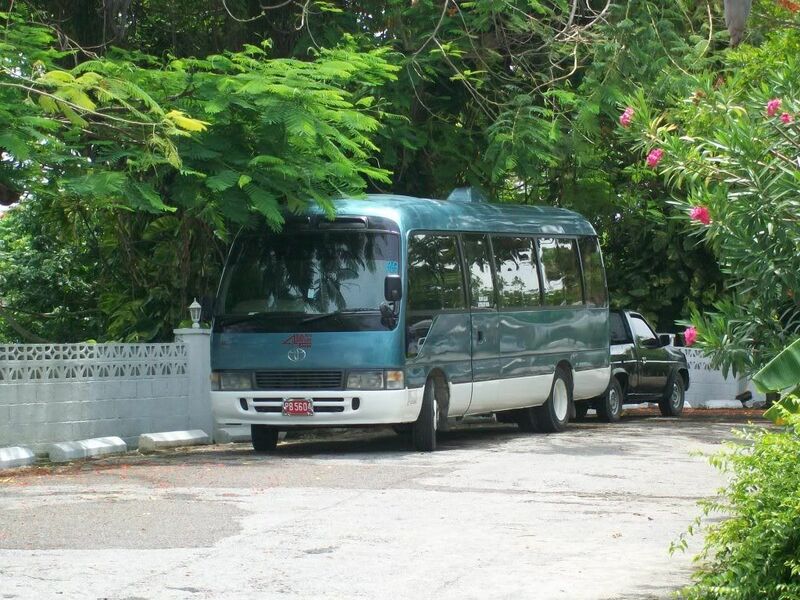 The ubiquitous Toyota Coaster arrived half an hour later than advised, took the 4 of us off towards Montego Bay and pulled off the dual carriageway on reaching the suburbs. This turn-off was to drive us round some of the nicer houses in the area before stopping at a "shopping mall" and directing us into one specific store where the driver was obviously very well known. As we filtered out into neighbouring shops we were gathered up and herded back onto the bus. 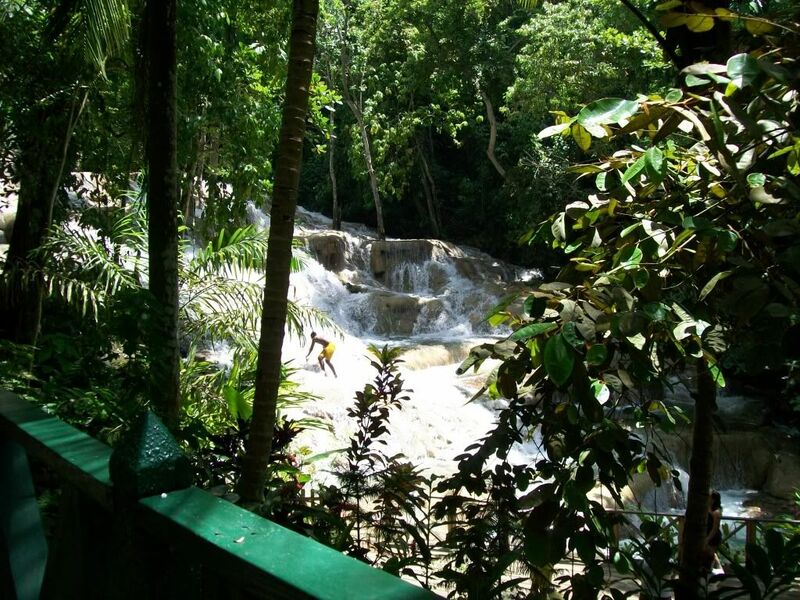 Duns River Falls - a lovely setting, but avoid the craft market. 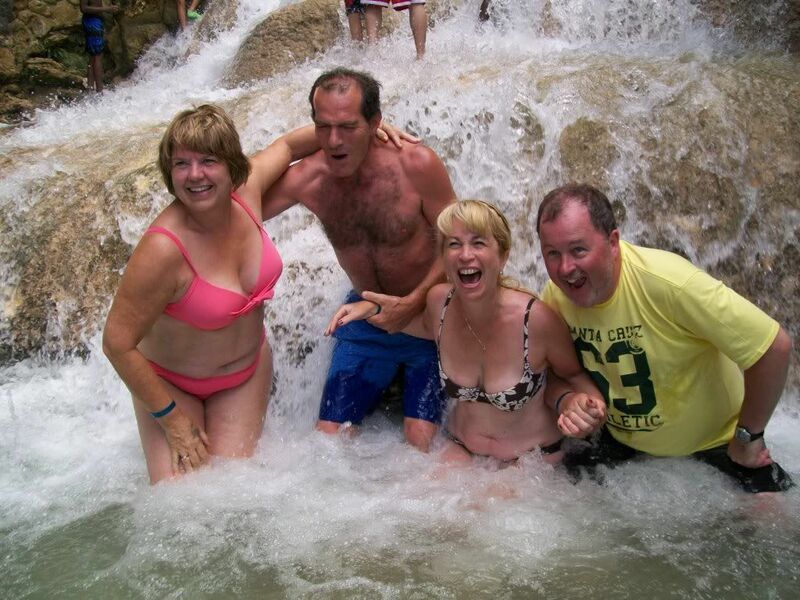 Us in the Duns River Falls - don't be fooled, it's cold. We were then driven through Montego Bay to a hillside witha view over the bay for some photos, then back onto the bus and back to The Fort Craft Market. Here we were well and truely perstered until we got so ragged that we all bolted for the safety of the bus. 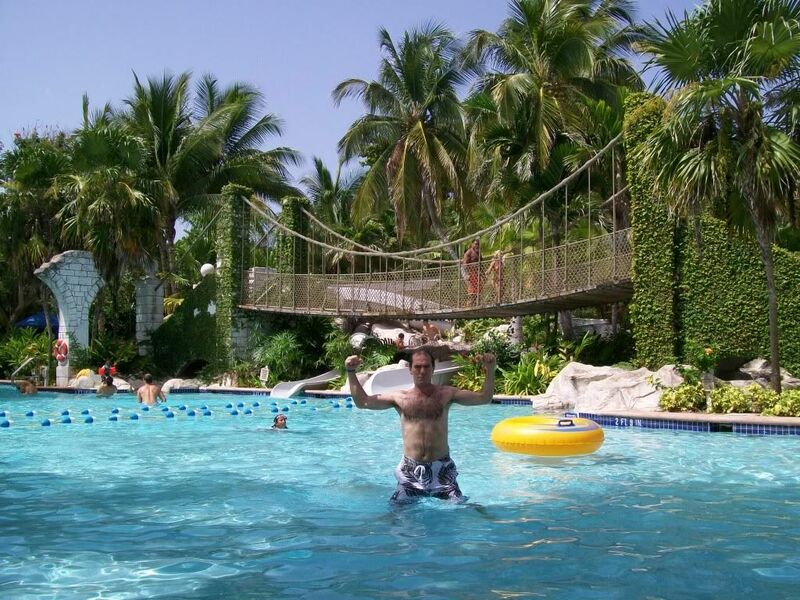 Despite driving past Margueritaville 3 times we didn't get the promised stop and cocktail and on finding that the driver was heading back to the first mall we told him that we wanted to return directly to the resort. We'd had enough. It wouldn't have been so bad if they left you to browse in peace but they are in your face with a hard sell all the time. What do they have to sell? T-shirts, millions of t-shirts and hand crafted artifacts which while beaufully worked (in the main) would be totally out of place even as ornaments once back home. 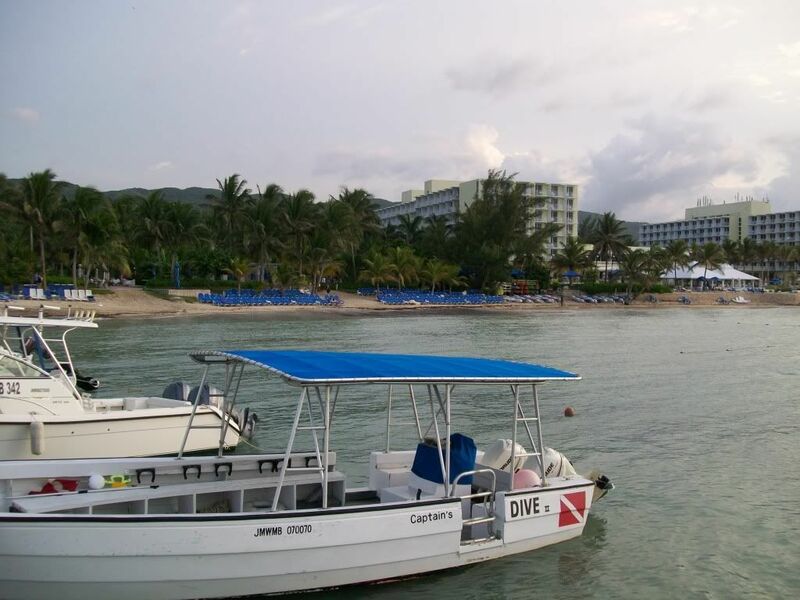 Before we left Jamaica we "did our own thing" and simply booked a taxi for a shopping trip from the hotel reception. The driver took us to the local "mall" which was deserted, and then on to a recommended local shoping street where we were able to browse to our hearts content - yes the local shop owners gave us a bit of hassle with their invites into their premises, but, once they realised we were there to do the lot, they became more personable and less pushy. And our taxi driver turned up at the agreed time to fetch us back to the resort. 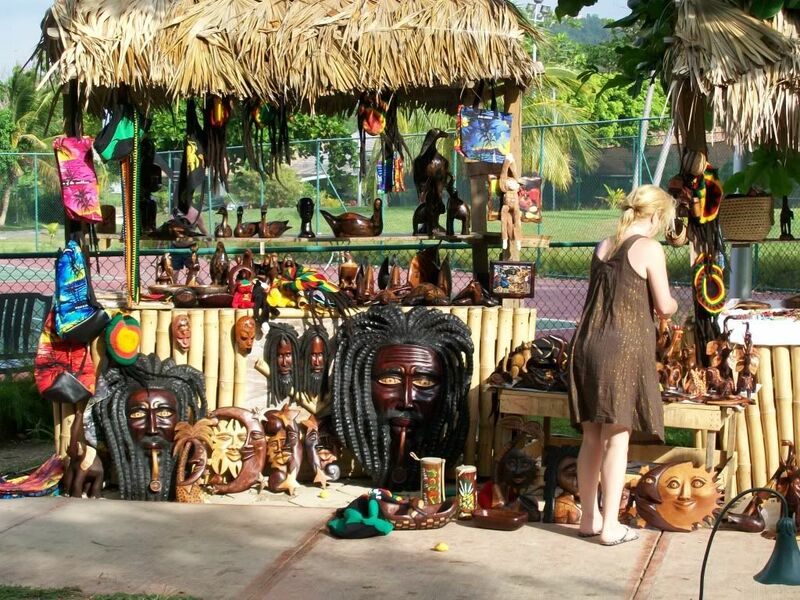 A craft stall on the resort. Strawberry Hills - one view of many. Strawberry Hills - from our dinner table. 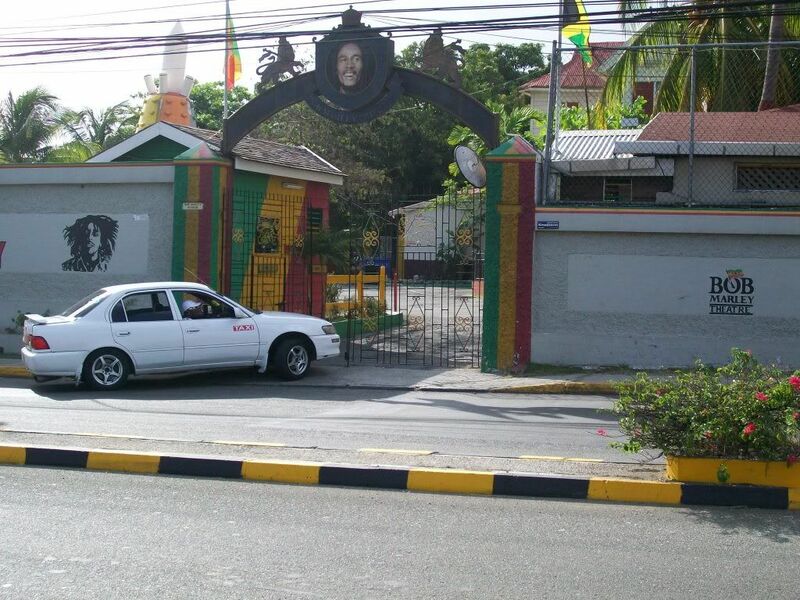 Bob Marley museum in Kingston. 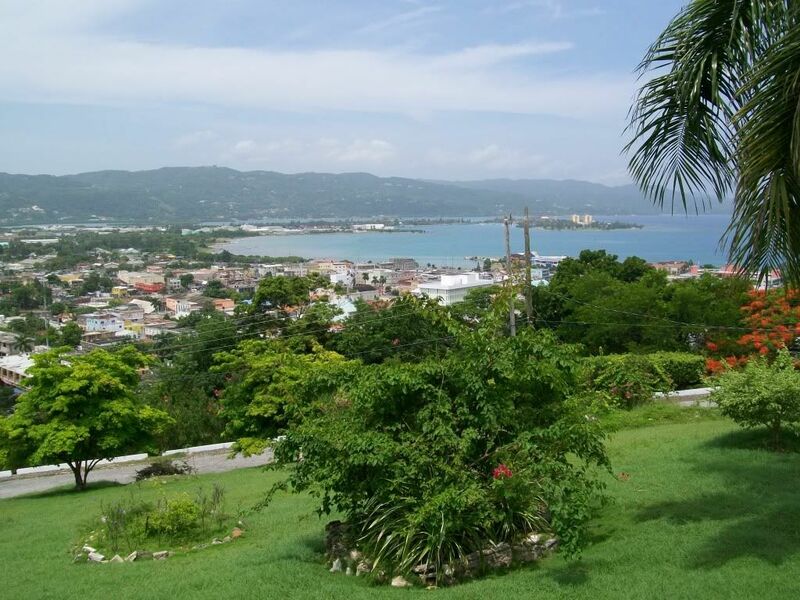 A view over Montego Bay. A view of our resort from the end of the jetty. Carribean sea - the reverse view back to the jetty. 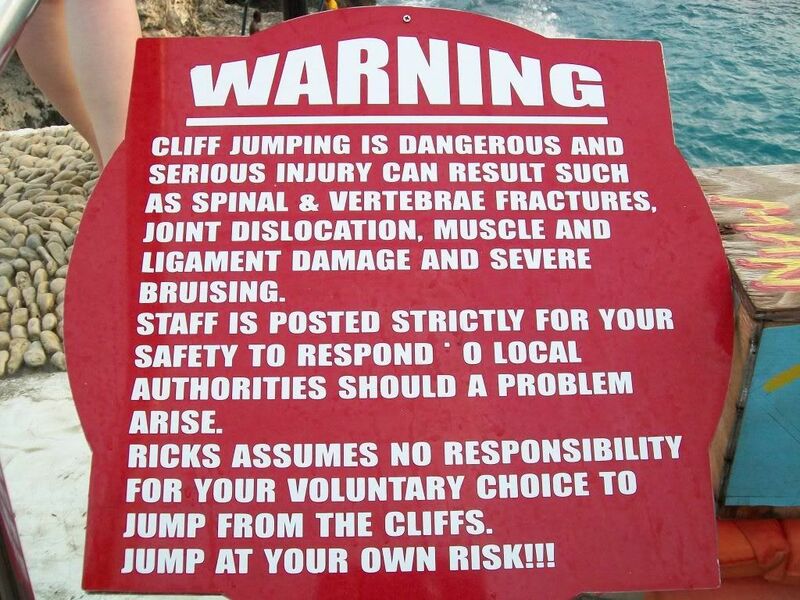 The cliffs at Rick's Cafe, where they jump from. Rafting on the Martha Brae. 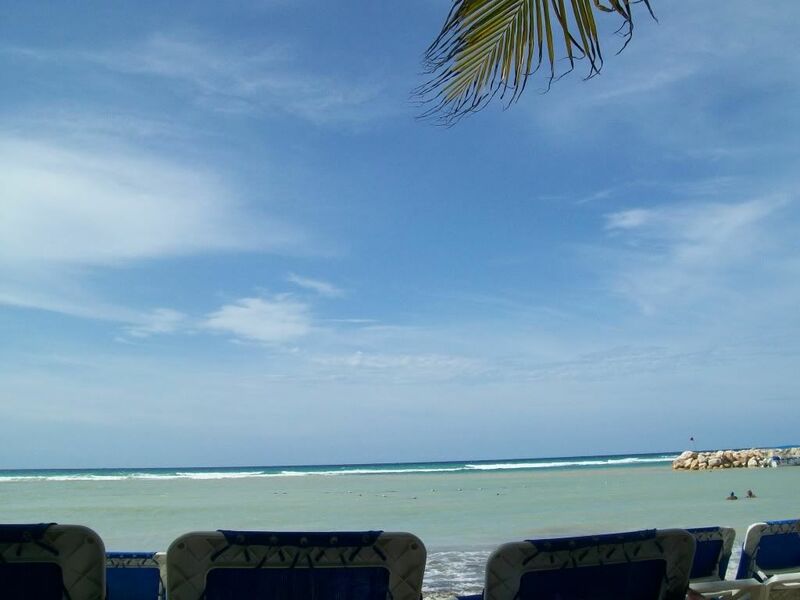 Negril beach - 7 miles long and gorgeous. A Toyota Coaster - they are everywhere.